The best friend who like me was feeling jaded with school suddenly made my day with her sms. Of course! A perfect way to spend my friday afternoon. I love everything about this humble establishment. 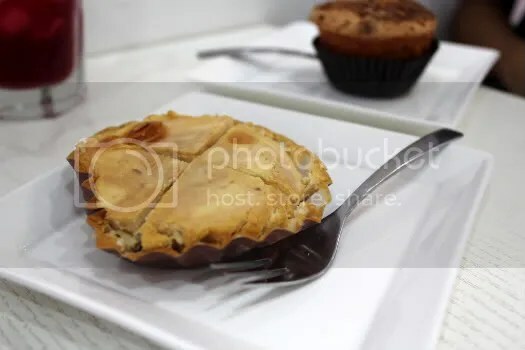 The cobalt blue and white combination, the alluring smells of sponge cake baking in the ovens at the back kitchen, the wide smiles of the lovely japanese ladies handling the cash register and most of all, their dainty little cakes sitting behind the glass counter. Do you like green tea as much as us? The grassiness and bitterness so characteristic of green tea were not lost in The Vert. 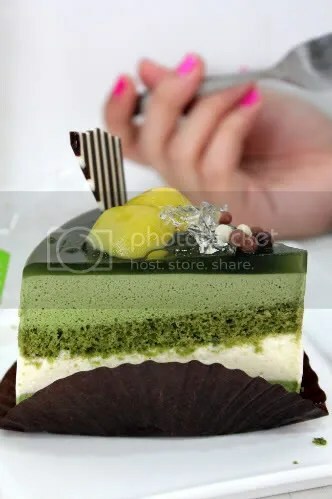 While the mousse was a little too stiff, the friend and I were sold by the intensity of the green tea flavour. 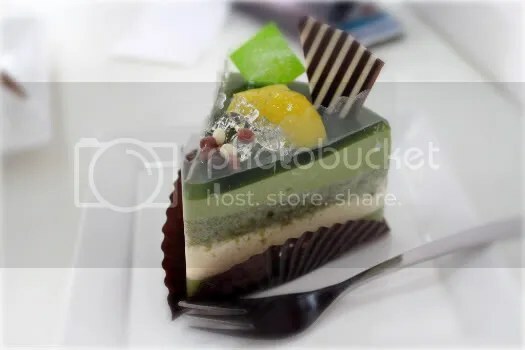 Much of it came from the mousse of course, and not forgetting the all important layer of green tea gelee on top which seemed to have 0% sugar. Quality green tea powder must have been used. 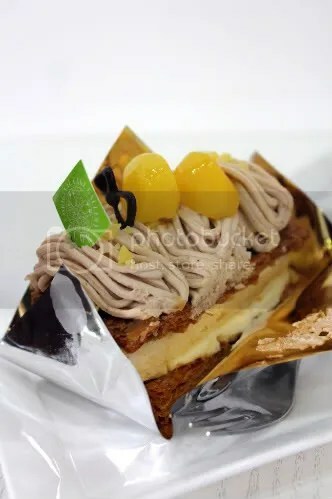 I absolutely had to order the Wagari MilleFeuille after reading countless recommendations about it from all you bloggers out there. Thank you because it was a truly sublime experience! I can safely say I conquered (part of) my fear towards cream after tasting the smooth dreamy chestnut cream that Flor had to offer. The puff pastry got a tad messy as I forked portions of it but I don’t really care. In the middle also sat sponge and custard to add extra dimensions to the ‘cake’. And the sweetened japanese chestnuts on top must be Flor’s signature ingredient. Soft with a slight nutty texture, two were simply not enough. The friend and I both opted for the tea-time set ($9) which consisted of 1 cake (what you see above) and 1 drink. After walking so much we were perspiring, dearly in need for some cold drink. This was the only cold drink on the menu but boy was it refreshing. 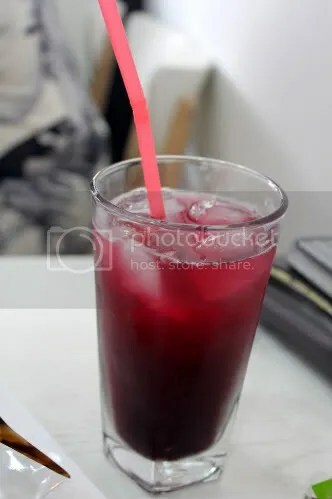 Iced unsweetened Hibiscus tea with hints of flowery notes (the guy in my school canteen refuses to serve me unsweetened tea, imagine my frustration) not only cooled us down but also cleared the palate as we made our way through the cakes. The iced caramel cheese tart is not something that I would choose but the friend likes things a little savoury. 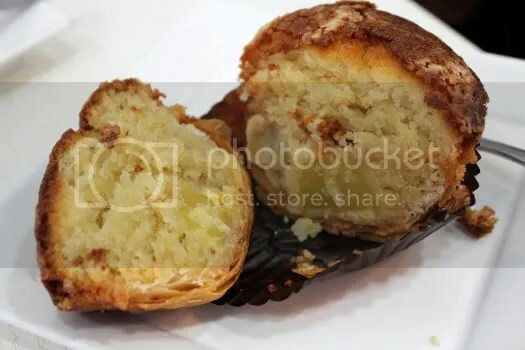 Icy cold filling was refreshingly addictive with the crunchy buttery tart base. Because it was so cold, the cheesiness didn’t come across too strong until it thawed a bit more. 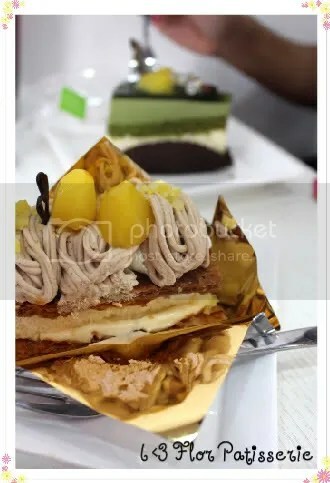 Another shot of this awesome cold dessert. Yums. The scrummy japanese chesnuts that adorned our cakes left us craving for more. 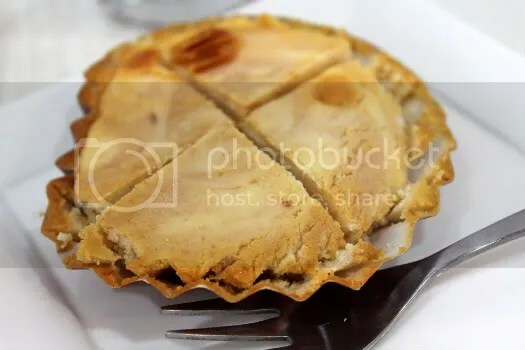 Marron pie struck our curiosity so we ordered it despite feeling full ( well, I won’t say 100% full!). 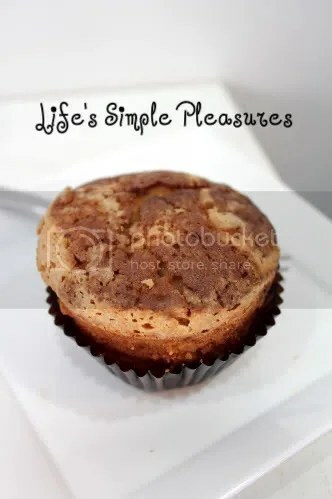 It was cup-cake like, soft and fluffy with a caramelised crunchy top. It also had a puff pastry base to justify it’s status as a pie. Right smack at the bottom middle was our favourite japanese chesnut. This would make a perfect breakfast with a cuppaccino! Part of me wishes that the place would be bigger to accomodate more people, the friend and I were a little uncomfortable as we huddled around a small table with all our bulky paraphernalia. But another part of me knows that if this place starts getting commercialized, it would lose it’s charm. There’s something different about any food establishment when the people making their food are happy and when people serving the food are happy. It makes their food, in this case cakes, taste so much better. Aah, I’m missing Flor already. Nice description of Flor. It sounds like a wonderful place and the cakes look absolutely delicious.